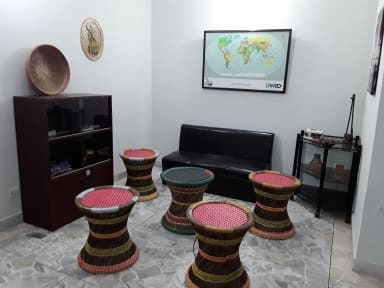 Our Golpata home became Bangladesh’s first B&B in 2013 as a way to establish a new kind of community-based tourism in Bangladesh, one that provide stable funding for children’s shelters run by our founders and also provide jobs to young adults. Starting from humble roots, we are waiting with a warm welcome for you at our B&B in Dhaka. After a long journey or red eye flights, we know the importance of a clean, friendly place for you to call home. When you walk through our door, you'll first notice that people seem to be very comfortable around here, lounging around or reading by the bookshelves. In the mornings, a choice of Western or Bangladeshi breakfast is included at our communal dining table. Since we also live here, our kitchen is fully stocked, complete with unlimited, eco-filtered, clean drinking water free for all guests. We are located in a safe community, and our building has 24-hour security. And our building has a rooftop if you like views! Our neighborhood is full of small shops, local markets, and cheap food. A quick rickshaw away are the famous areas of Banani, Gulshan, and Basundhara. We are close to the airport and train station, perfect for onwards travel. We also arrange personalized day trips around Dhaka city and to neighboring handicraft villages, memorials, etc. Add Bangladesh to itinerary, it will be an unforgettable experience! Bangladeshis are loveliest people and helpful! Fab hostel and met fellow backpackers here to share trip costs and chat with. Joanna and Arnob were superb! Kind, caring and very helpful. 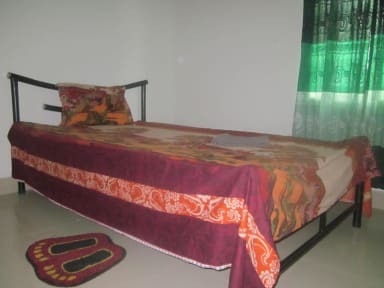 They offer many tours (I did fab Old Dhaka (1600 tk) for guide, 27 hour Rocket Paddleboat Trip and 3 Day Boat Trip to/in Sundarbans 13,500tk) Golpata rooms are super clean, comfy beds, mos nets, hot water, free tea and coffee, near airport. They made me feel super safe and happy! Dhaka is chaos of the city and starting from that point this hostel is 5 star hotel if u ask me,even better it felt like super comfey friend apartmant. I wanted to go to orphonage so Joy personaly took me there, (i loved my days there a lot i miss the kids already), he took me for super nice street food as well, and Arno was making great breakfasts. I also met few solo traveler which was great for not vosothing old Dhaka alone. Thank u giys for everythig! Amazing experience with Joanna and Joy! They were great at e-mail communication before I arrived (re: middle of the night arrival, getting there from the airport etc.) and stayed up late to welcome me. I spent 3 amazing days with them over Christmas visiting the orphanage, their friends and National Martyrs' Memorial. They went above and beyond at every opportunity. Would strongly recommend. The hostel was easy to find, close to the airport, very clean and modern & had great wifi. Thank you! Great facility, very comfortable. Owner is a fascinating woman from the Netherlands. Very close to airport. They also run some tours from here if you’re interested. Arrived v.early 0300 (got uber using the free Wi-Fi at the airport just 20 mins,only 2£). Not so easy to find so try have google maps on, it’s in an apartment block. The lads working there were brilliant, helpful , flexible with breakfast times, clean room, let me have a late checkout and helped me get back to airport. Local area charming and quieter than old town.Take Tuktuk to town for an experience; it takes about 1.5h, but all transport seem slow in Dhaka . Would stay again for sure, . Extremely hard to find and far from everything. You’re basically staying in an apartment but it’s the only hostel I’ve heard of in Dhaka. The breakfast was nice but the owner was rude about the overuse of peanut butter. If I went back to Dhaka again I’d fine a hotel nearer to old Dhaka so it doesn’t take an hour or two to get there from this place. It was a useful place to stay for a couple of days. The staff were nice and we were able to work out some confusion over the price of the room ( I was the one who was wrong). They were very patient with me in the above situation. It is good if you want to be close to the airport or Gulshan but hard to find and hard to get an Uber from. It took me about 4 days to work out the area. Considering this and how hard it is to find it is quite expensive. I would stay again though if I needed to. The place itself is good. I was able to meet somebody to explore Dhaka with which is nice. The hostel is kinda close to the airport but really far from old Dhaka and all the tourist sites (plan about 2 hours IF the traffic is NOT to bad). There are no lockers at this place. In my opinion the price of 15$ is way to high especially for a bed in a dorm room. 5-8$ a night would make this a great place but I cannot recommend it for 15$. Go on Airbnb and you'll find privates for less.